The Dark Crystal is a considered a classic for those that grew up in the 1980s and is a film that still translates well to this generation of children. In an era where so many things are CGI, it's refreshing to experience this film all over again and see the true artwork that is showcased. Jim Henson's The Dark Crystal was released in 1982 and became a staple of many 1980's kids' film experiences. The film, while geared towards children, wasn't a typical fluff piece that the 1980s family/children film genre can be guilty of. Through it, we were introduced to a whole new world of characters that have endured in our hearts throughout the past 35 years. The film follows Jen (voiced by Henson himself), who is raised by a race called the Mystics and is the last known survivor of his race, the Gelflings. He is sent on a journey by his master to repair the Dark Crystal, which was responsible for the balance in their universe. After the crystal was broken, an evil race called the Skeksis gained control and brought corruption to their planet, Thra. If Jen can repair the crystal, the balance will be brought back to the universe and the rule of the Skeksis will end. Along his journey, Jen learns that he isn't the only Gelfling to survive when he meets Kira, who was raised by Podlings after her parents were killed. Together they must set out to complete the task of repairing the crystal, the task that is only destined to be completed by a Gelfling, and save their universe. It's safe to say Jim Henson was a groundbreaking artist in the field of puppetry. With The Dark Crystal, we see Henson's designs come to life through complicated animatronics and puppets. His characters were partly influenced by the artwork of Lewis Carroll, showing crocodiles wearing elaborate wardrobes and living in a palace. He also wanted to bring a darker sense of storytelling back to the children film world, because he felt as if it wasn't realistic to always make stories so "happy" and "safe". He wanted to instill a bit of anxiety into the viewer; for them to feel the gravity of the film. He also pulled inspiration for the film from The Land of Gorch, which featured a more adult form of puppetry, and was featured as skits on Saturday Night Live. His team's artistry and commitment to perfecting every move is evident and the realistic look shines through. The video is presented in it's original 2.39:1 aspect ration and encoded in HEVC / H.265 coded with 2160 lines of resolution using HDR10. The picture itself is absolutely amazing. Henson and Froud made every aspect down to the smallest detail of the film true. Even the finest blade of fake forest grass looks absolutely stunning and with the HDR10 balance thrown in. It truly feels like you are actually there in the world of The Dark Crystal and it is impressive. The real treat for this re-release of the film is the inclusion of a Dolby Atmos soundtrack that been created just for the theatrical release and this 4K UHD version of the film. It is amazing and truly something to hear. Instead of just having the world of the Crystal surround you, it actually takes up the entire room. From left to right, from top to bottom there is no escaping the world of fantasy that Henson created. This 4K UHD release IS the definitive release for any casual or full-fledged fan of this fantasy classic. Aside from the amazing new transfer of the film, it includes over two hours of special features including an all-new featurette entitled, The Myth, Magic and Henson Legacy — a behind the scenes look at the making of The Dark Crystal narrated by Lisa Henson and Toby Froud. 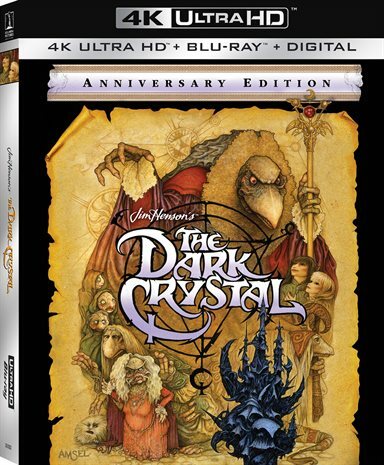 This as well as the other special features: a deleted funeral scene, audio commentary with creature designer/illustrator Brian Froud, Picture-in-picture storyboard track, Original Skeksis language scenes with introduction by screenwriter David Odell, The World of The Dark Crystal documentary, Reflections of The Dark Crystal: "Light on the Path of Creation" & "Shard of Illusion", Photo galleries, theatrical teaser & trailer all combined to make repeat viewing of the disc almost guaranteed. The Dark Crystal is a considered a classic for those that grew up in the 1980s and is a film that still translates well to this generation of children. In an era where so many things are CGI, it's refreshing to experience this film all over again and see the true artwork that is showcased. This 4K UHD release is the best The Dark Crystal has ever looked on or off the screen. It is highly recommended you pick up this "definitive edition" of this classic film. Also be sure to turn into Netflix late this summer for the 10-episode series The Dark Crystal: Age of Resistance. Download The Dark Crystal from the iTunes Store in Digial HD. For more information about The Dark Crystal visit the FlickDirect Movie Database.